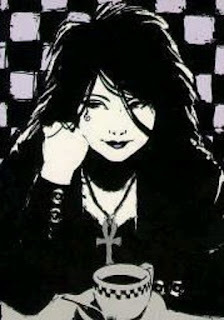 Death from Neil Gaiman's Sandman series. I was in grad school at the time, living with five undergraduate guys who were just slightly younger than I was. Carrie had grown up next door to one of them and he thought of her as a little sister. I don’t think she was out of high school at the time. One night we went to hang out at the rehearsal space for a local punk band called Faces of Death. It was in the basement of an office building in the downtown section of the small city we lived near. Though I was a veteran of large concerts this was my first up close exposure to the punk underground (but not the last). It was supposed to be a band practice and while loud music was played for awhile it turned into more of a just hanging out and drinking kind of party. Carrie was there. Though underage she knew everyone and my roommate in particular was looking out for her, at least to the extent of her physical safety. She was drinking with the rest of us. A few people went outside for a smoke break, and even though I don’t smoke some fresh air seemed like a good idea. That night Carrie had applied a lot of Aquanet to her hair, sculpting it into wing-like crests on the side. A long black devil’s lock hung stiffly over her face. While lighting a cigarette the devil’s lock caught fire and went up like a fuse. At least three of us jumped into action, trying to put it out, slapping the poor girl in the face and head before the entire thing was engulfed in a hairspray inferno. We were successful. Carrie wasn’t even burnt. The devil’s lock was a thing of the past though. I have no idea what ever happened to Carrie. She would be well into her 40s by now. Does she still embrace her Gothic past, or is she slightly embarrassed by it? Does she remember the night she was on fire?